By Allison Petty Photos by Christopher Paparo The Holy Grail As a professional aquarist, my career has presented me with the opportunity to work with a variety of remarkable marine life. Working with animals from sharks to mammals, and electric eels to reptiles has been very rewarding, but none compare to the experience of working with cephalopods. At Atlantis Marine World, I care for our two cephalopod exhibits, the giant pacific octopus and cuttlefish. They are two of the most popular exhibits at the aquarium. Their unique, almost alien-like appearance, combined with their ability to change color and shape in an instant, keeps visitors mesmerized in front of the exhibits all day. Sadly, the specimens kept in these two exhibits are not with us for long. All cephalopods have a very short life span, some lasting less than a year. 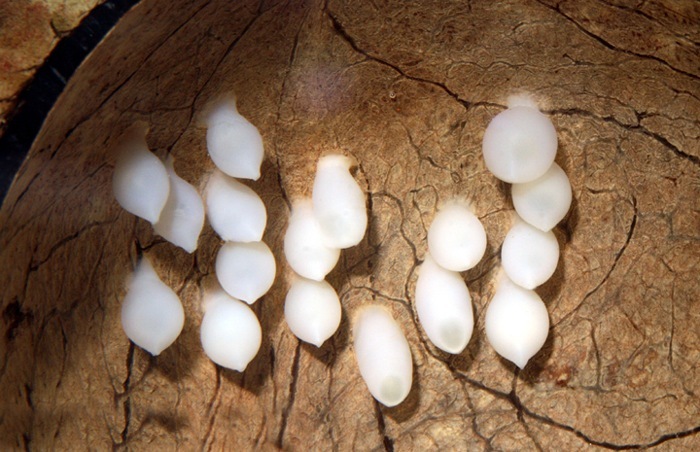 They hatch, grow quickly, and die shortly after reproduction. 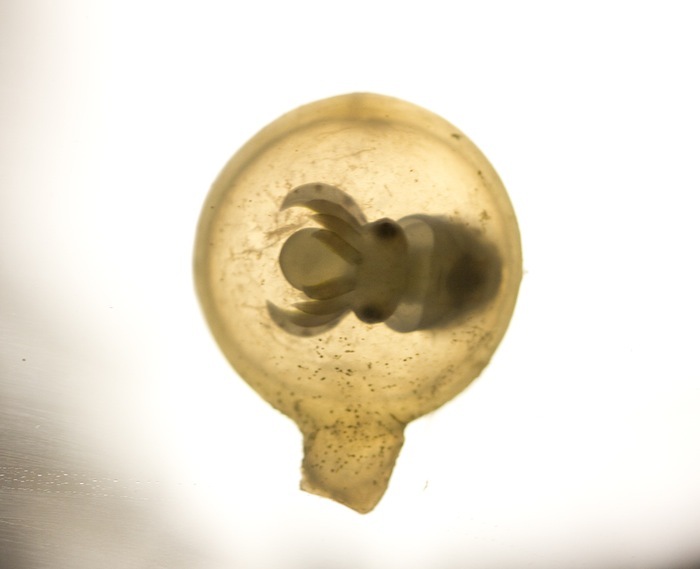 Fortunately though, this short life means they reach sexual maturity in a reasonable amount of time, making captive breeding of many cephalopod species possible. Typically, we keep Sepia officinalis or Sepia pharaonis, and I have been fortunate enough to raise both species. Recently, however, a twist of fate has afforded me the opportunity of a lifetime. This journey started almost a year ago when a marine life wholesaler in California called to tell us that he had some Metasepia pfefferi (flamboyant cuttlefish) coming in and asked if we were interested. Since it is considered the holy grail of cephalopods and probably the coolest animal on the planet, what could we say? The M. pfefferi was being sent next day via FedEx, which meant there was little time to prepare. Swinging into high gear we quickly set up a home for it, which ended up being a 24-gallon Via-Aqua tank with a shallow bed of live sand. The cuttlefish arrived the very next day. We acclimated it to its new home, and I immediately fell in love. Since I have never taken care of a flamboyant cuttlefish before, I contacted Richard Ross, the “cephalopod guru”, to ask for any useful information. He told me that it is common for flamboyant cuttlefish to mate before being collected. 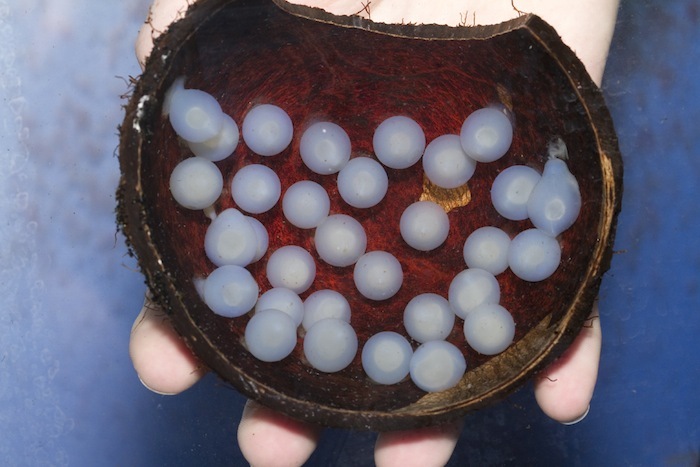 He explained that they prefer to lay their eggs under ledges and he recommended adding coconut shell halves in the tank, just in case by some miracle we received a gravid female. It seemed like a long shot that this cuttlefish could have reached sexual maturity and mated already, as it was only 2.5 inches in length. After giving the cuttlefish some time to settle in, we offered it a live shore shrimp (Palaemonetes pugio), which it immediately stalked and devoured. The flamboyant is like no other cuttlefish I’ve encountered before. Most cuttlefish are masters of camouflage, having the ability to blend in quite well with their surroundings by changing the texture as well as the color of their skin quickly. Flamboyant cuttlefish share this ability to blend, but can also take their appearance to the other extreme with their stunning coloration. When they feel threatened they show a remarkable rippling display of colors down their body from bright yellows and whites, to bold purples and reds, making them stand out vibrantly. This show of colors is also a way to broadcast to potential predators that it is poisonous. It is said to be as lethal as a blue-ringed octopus, making the flamboyant cuttlefish the most toxic of the cuttlefish species. Another odd behavior of the flamboyant is that unlike other cuttlefish that are usually shy and spook easily, flamboyant cuttlefish are courageous. They will stand their ground instead of jetting off into the background of their tank. These behaviors make them very intriguing and guaranteed to hypnotize anyone. Needless to say, none of us got much work done for the rest of the day. As the flamboyant was settling in and getting comfortable in its home, I added it into my routine of daily feedings and water changes. Being that Atlantis Marine World is located on a tidal river, it is very convenient to get endless amounts of shore shrimp and killifish. 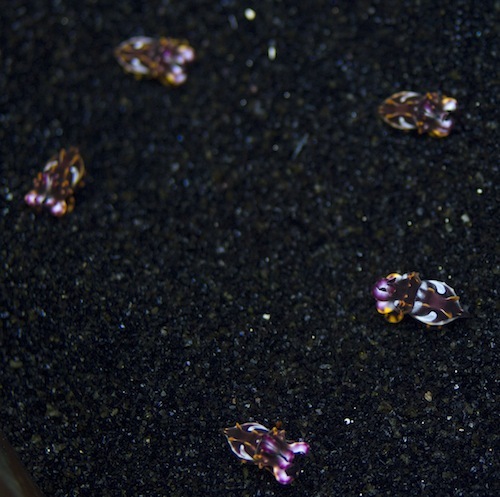 These shrimp and killifish are enriched with Cyclops and salt-water mysis before they are fed out. Using live food helped maintain good water quality since any uneaten food would be alive and not foul the water. However, being that it was a new system and cycling, I did a 15% water change, 3 times a week in order to keep the ammonia, nitrates and nitrites as close to zero as possible. I kept the salinity around 33 ppt, the pH between 7.8 and 8.0 and the temperature close to 73 degrees Fahrenheit. This combination seems to keep the flamboyant happy and healthy. 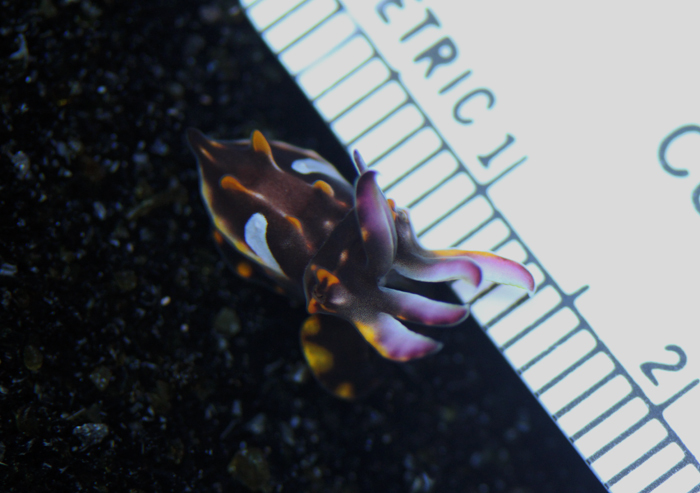 Metasepia pfefferi is an amazing species of flamboyant cuttlefish and I have recently had the opportunity to obtain multiple specimens of this species for the first time in 8 years. 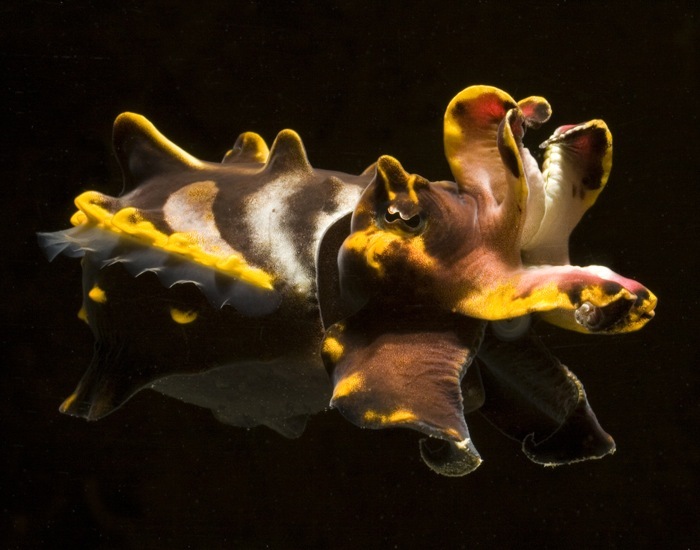 These flamboyant cuttlefish wasted little time getting on with mating, and with a little luck we’ll get to observe egg laying — and with a lot of luck egg hatching. After about 3 weeks of giving this flamboyant a lot of special attention the unthinkable happened: she laid eggs! The morning of July 4th was a memorable one to say the least. On my morning rounds, I stopped to say good morning to her and to my surprise there were about 20 perfect white eggs in one of the coconut halves. Ecstatic beyond belief, I needed to find someone to share my excitement and that someone happened to be Senior Aquarist, Chris Paparo. He told me not to get too worked up because he thought there was a high chance that they were infertile. However, I had a strong feeling otherwise and was excited to watch them develop. With the exception of marine mammals and a few other taxa (damsels, cardinals, crustaceans, etc. ), maternal instincts are lacking in the marine world. Most marine organisms release egg and sperm into the water, and hope for the best. The flamboyant cuttlefish is one of those exceptions. Most of the day she spent tending to the eggs, keeping them clear of detritus and other fouling agents, and guarding them from possible predation. Even though she was alone in the tank and there was no predation threat, she would still “pace” back and forth in front of the shells using her tentacles and two leg-like appendages that looked as if they were molded from the bottom of her mantle. 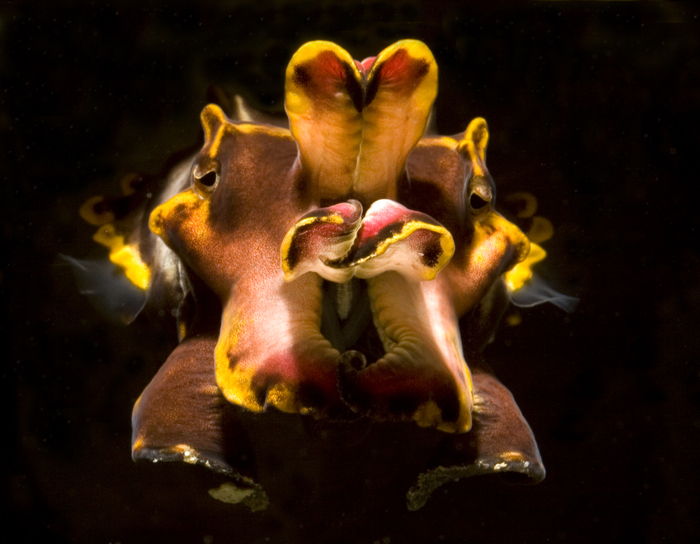 Instead of swimming, flamboyant cuttlefish spend most of their time literally walking around on the substrate. This benthic behavior is due to their smaller than normal cuttlebone. All cuttlefish have a cuttlebone, which is made up of calcium carbonate. It is divided into chambers and depending on the buoyancy that a cuttlefish needs, it can either empty or fill these chambers with gas. Since the flamboyant cuttlefish has a small cuttlebone, they have a harder time with their buoyancy and cannot swim for long periods of time without sinking. On August 10th, approximately a month after the first egg was laid the unimaginable happened and possibly the most important day of my career had come. While giving out her first feed of the day, I noticed the most beautiful, tiny baby cuttlefish hanging out on the wall of her tank. Not believing my eyes, standing there in shock and awe, fellow Aquarist Todd Gardner rounded the corner and asked what I was looking at. As I showed him the 1 cm long carbon copy of the adult flamboyant we stared in silence together, then celebrated for about 5 minutes before starting to think about setting up a tank for Junior. Here at Atlantis Marine World, we believe in keeping things simple. So for Junior’s tank we used a 10-gallon tank with a hang on the back Aqua Clear mini filter and some live aragonite as substrate. After the new system was running and ready for its first occupant, I carefully scooped up the tiny baby in a deli cup and gently transferred it into its new home. Now for the hard part, what to feed this little guy? After doing some research, I found that newly hatched mysid shrimp were needed to feed Junior. I located a company in Florida, Marinco Bioassay Laboratory, which cultures mysids. After making a call, I ordered the smallest possible mysids they could ship me, which were 7 days old, and hoped it would be suitable. To my relief they were and it didn’t take long for Junior to track them down and consume them. Keeping the water parameters of the tank as close as possible to its mothers was easy enough; it was keeping the right amount of food in the tank that was more difficult. Too few mysids made catching one more difficult, but too many would stress Junior. Over the next two months ten babies hatched. Unfortunately, two of these hatched prematurely. The two preemies had buoyancy issues and one still had a yolk sac. Needless to say, they did not survive. Keeping all eight hatchlings in the same tank worked at first, but started to become an issue when it came to feeding. Since there was a 2-month difference from the oldest to the youngest, the oldest seemed to be over powering the little ones and eating a majority of the food. At 2 months, the oldest was big enough to eat something more substantial than mysids, so I searched through the shore shrimp tank to find the smallest shore shrimp possible. At about a quarter of an inch long, I broke off the rostrum of the grass shrimp and dropped it in the tank in front of the oldest baby. To my delight he ate it right up. The feeding process started to get tedious and time consuming. It was a real challenge to make sure that all of the babies were getting enough food, so more tanks needed to be set up. The 10-gallon set up was working just fine, so I set up two more 10-gallon tanks and another 24-gallon Via-Aqua. I size sorted the babies and split them between the four tanks. This seemed to work out well, especially when it came to feeding. Being able to see how much they were eating and weaning them from mysids to grass shrimp was easier and less stressful. Although feedings were simpler, I increased my maintenance workload by three-fold. I was still water changing their mothers’ tank 3 times a week, and now having to do the same for the four baby tanks was repetitive yet necessary to keep up with the proper parameters for these guys to grow and be healthy. All the work I’ve been putting in with these guys was challenging and monotonous at times but it was beyond worth it. When the oldest babies reached ages of about 4-5 months, they were big enough to be displayed. Getting the “o.k.” to redo the existing cuttlefish exhibit, I replaced all the substrate and décor and revamped the overflow so the smaller cuttlefish would not get stuck to it. 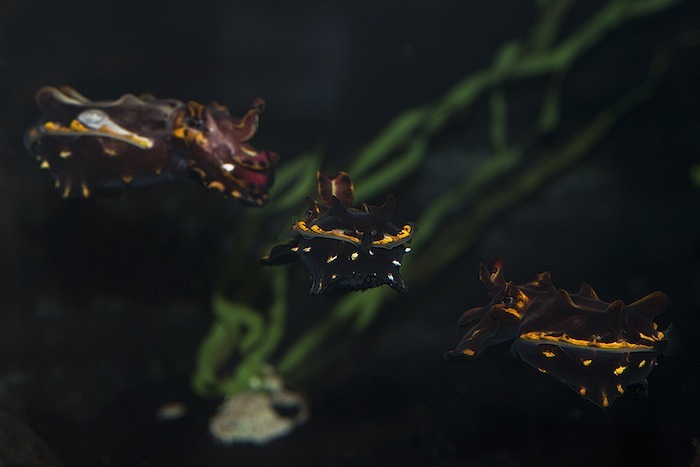 Once finished, I moved 6 flamboyant cuttlefish to the 500 gallon half circle exhibit. They got along for the most part. Surprisingly it was the smallest one that caused some trouble. He would get up in the others’ faces, follow them around, and threaten them. Basically it was like he had Napoleon complex and was trying to prove himself. This lasted for about 2 weeks before they all settled down, made peace with each other and made excellent display animals. Meanwhile, back behind the scenes, their mother was still going strong. She continued to lay hundreds of eggs and took great care of them. There were no more fertile eggs by this point, but she still acted as if there were by guarding and cleaning them. She continued to eat very well until mid-January. Her eye sight started to go and she was missing her food. Like all Cephalopods when it is their time to go it is very sad to watch as they slowly perish. By my calculations she was at least 14 months old, and knowing cephalopods are short lived, I figured she had lived a long, fruitful, and what I hope was a happy life. January 27th was a sad day for me as my first and yet very successful Flamboyant cuttlefish had passed. With all that I have learned from her, I hope I get the chance to repeat this process. All I can do now is wait and see if her legacy will live on with the hope that the courtship I am seeing with the new generation will be equally bountiful. UPDATE: As of this writing, Allison’s hopes for the second generation have been realized as evidenced by the photos and video below. Several captive bred specimens have now been reared and sent to other aquariums for further study. Congratulations on yet another stunning achievement!